Identify new company segments, message a company, and remove users from a company. 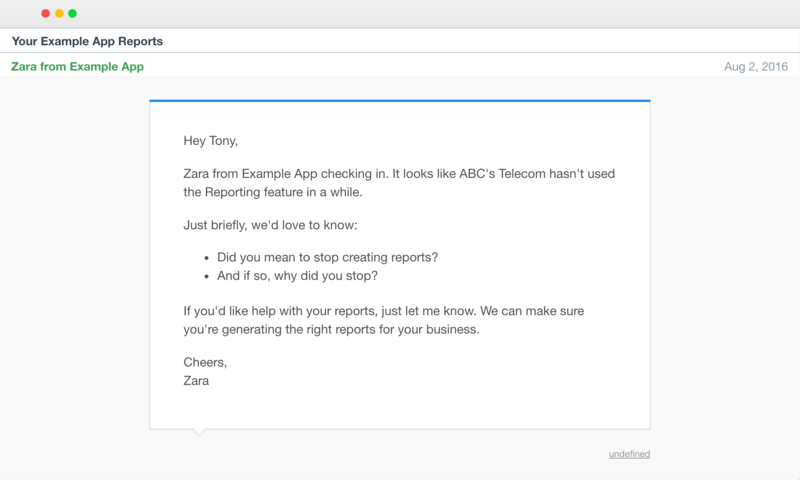 If you sell to businesses then you need to be using Intercom's companies feature. 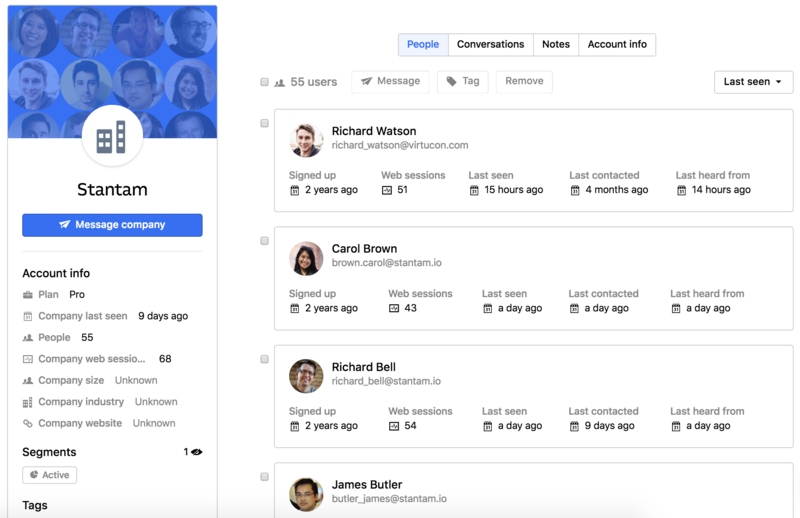 By default, Intercom treats all users as individuals, but the companies feature groups all the users from the same company together. Why use the companies feature? Which companies are all paying us more than $100 a month? Which companies have more than 8,000 users? Show me a list of companies who are eligible for our next private beta round. Once you've created these lists, you can save them as segments. For example, you could create a segment of companies who are on your highest plan, but have not been active in 30 days. Or, you could create a segment of companies who have all stopped using a particular feature. You can also tag a company to manually add them to groups of interest (tags are similar to segments except that users are tagged manually, but are added to segments automatically). Once you've drilled down to identify the groups of interest, you can then send them targeted messages. So for example, you could set an auto message to go to everyone who gets added to the 'Stopped using feature x' segment. The message could link them up to start using again, or like in the example below, could simply be asking why they stopped. Important: If you use company attributes in an auto message it will cause the auto message to target anyone in that company. Users in more than one company will receive a separate message for each company. When you click into any given companies profile page, the first thing you'll notice is the company profile card which shows you things like where each member of the team is located, what plan the company is on, how many open conversations they have, and more. You can see everything happening with that company in their activity stream. You can see who everyone in the company is, and what they've been up to here in the users tab. You can see all the conversations with that company here and you can reply here too. You can leave notes about a company so that you and your team members have more context when they visit their profile page. Company information is sent over in the intercomSettings code snippet, as a JSON object called company. Note: Company ID and company name are the minimum requirements to pass a company into Intercom. It's easy to remove any user from a company profile. Just visit whatever company profile you'd like and select the user/users you'd like to remove. Then click the 'Remove' button. 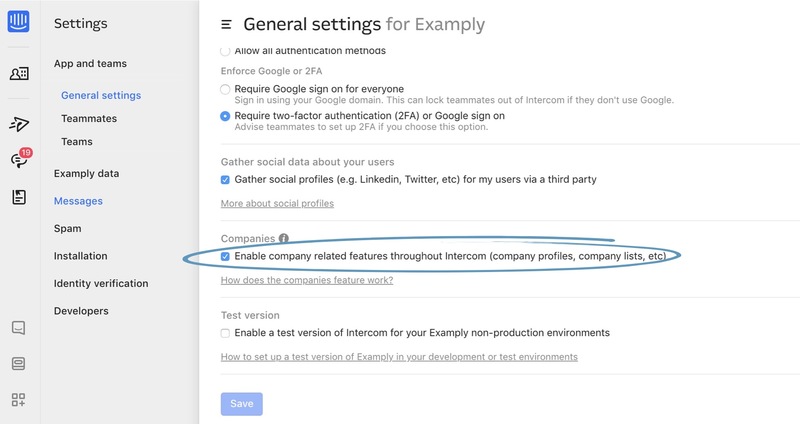 Companies will not appear within Intercom until users have been added or associated with a company. You can also create companies via the API if you like. You should input only rounded integer values for the monthly_spend attribute in your company's data, as we automatically round any float values. For example, if your monthly spend is 10.4 you should round it to 10. If a user is associated with multiple companies we don't know which company's sessions to update, unless we have a company_id. So in order for the company's sessions to be updated, the user update has to contain the company object. Users can belong to multiple companies, but you should only send us the data for the company that the user is currently signed in with. You can also send other attributes within the company object. Those will be treated like custom attributes for that particular company. You can read more about custom attributes here.